Item shown above : Natural Hardwood in Mahogany FINISH with a glossy protective coat (curio/figurines sold separately). This is one of our hottest item. 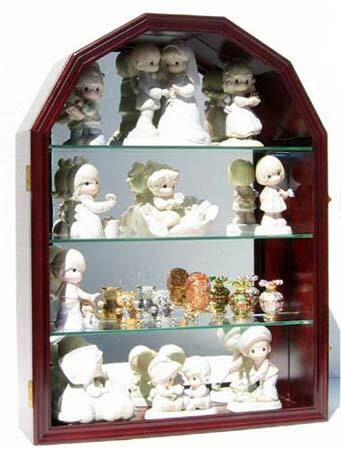 Beautifully crafted, this arch shape curio cabinet would be perfect to display your curio and figurine collection. Mirrored background to create a refreshing and lovely contrast. 3 removable shelves allow you to display larger items if needed. Finely sanded to achieve elegant and smooth surface. Brass hinges and door latches, Wall brackets on the back for hanging (wall mounted). Works as well on top of table. Glass door prevents dust and damage while giving easy access. Built-in Lock.No assembly required. Distance Between Rows: Top: 7", all other rows 5 to 5.25"